Threaded mounting holes permit mounting to a chassis, cabinet wall or bracket, or they may be used on a test bench or table top. 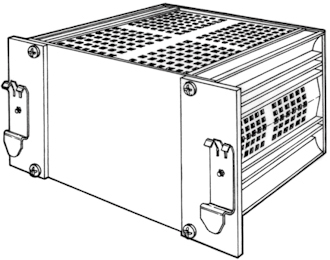 Model NP6L consists of two brackets 1.5" long as shown below, and two 2.5" long brackets (to extend beyond heat sink). To mount from the power supply side of the mounting surface, necessary when the other side of the mounting surface is inaccessible, use accessory Mounting Kit GB8, NP6 or NP6L. 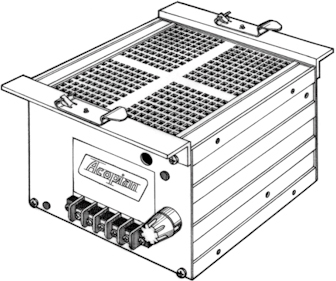 These kits consist of four aluminum brackets and four machine screws for fastening them to the modules, effectively adding mounting flanges to the modules.